The Morton Street Slasher has been leaving the corpses of his victims around San Francisco's Union Square. On the women's naked bodies are spade playing cards. The city's infamous newspaperman, Ambrose Bierce, blames the rash of murders on his old enemy, the Southern Pacific Railroad. A naive reporter at Bierce's Hornet pursues the case, uncovering conspiracy at every turn. In a fast-paced novel that is a combination of murder mystery, historical fiction, and quirky biography, Oakley Hall draws the reader into 1880s San Francisco and the changing world that was California in the latter part of the nineteenth century. Local and state politics, the exploitation of the Chinese, the power of the mining and railroad barons, and San Francisco's colorful history provide a backdrop for this irresistible thriller. The novel's chapters are introduced by appropriate excerpts from Bierce's The Devil's Dictionary and narrated by the young reporter Tom Redmond. Redmond is interested in the murders because of his attraction to a woman threatened by the Slasher, and Bierce encourages him because of his personal vendetta against the Big Four of the Railroad. Bierce's misogyny is an influence as well, which Hall uses to advantage in portraying the enigmatic journalist. Hall knows his territory and his characters well. The sights and smells of late-nineteenth-century California are cleverly evoked, and the story's key players are refreshingly authentic. Bierce brandishes his famed cynicism with all the aplomb of the sharp-eyed, sharp-witted newspaperman he was. Cameo appearances by such California worthies as Ina Coolbrith and Joaquin Miller add to the novel's historical richness. 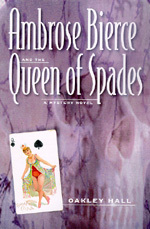 Intelligent, gripping, and often quite funny, Ambrose Bierce and the Queen of Spades will satisfy any reader who craves adventure, mystery, romance, and fine writing. Oakley Hall is the author of twenty works of fiction, including Warlock (1958) and Separations (1997). He lives in San Francisco.